“Let us go now to Bethlehem and see this thing that has taken place.” That’s what the shepherds said after the angels had left them and gone into heaven. It wasn’t enough to just hear the good news. It wasn’t enough to just receive the birth announcement. Somewhere deep within they wanted to be a part of this thing that had taken place. The angel’s good news wasn’t just an announcement, it was a calling. They had to go and see. They left their fields and went to the manger and in so doing they moved from the event of Jesus’ birth to the experience of his birth. They made the Christmas story their own. That’s what I hope we’ll do tonight. I want us to be like the shepherds. I don’t want us to just talk about Bethlehem, I want us to go there. I don’t want us to figure out the meaning of “this thing that has taken place.” I want us to find meaning in “this thing that has taken place.” I want us to move from the event of Christmas to the experience of Christmas. So let me start by asking you a question. What is your Christmas story? I’m not asking about your family traditions, the gifts you exchange, the food you eat, or the way you celebrate Christmas, and I’m not asking you to tell me the Christmas story as recorded in the Bible (Luke 2:1-20). I’m asking about your Christmas story. When have you, like the shepherds, gone “to Bethlehem [to] see this thing that has taken place?” I want to hear about a time when you knew your life to be the manger of Christ’s birth. Tell me about a day when your life cradled new life, new hope, new possibilities. The reason I am asking about your Christmas story is because I think we often leave ourselves out of the Christmas story. We always name Mary, Joseph, Jesus, angels, shepherds, wise men. But what about you and me? Do we name ourselves as essential characters and participants in the story? I sometimes wonder if we have become the forgotten characters of the Christmas story. I sometimes wonder if we focus on the particulars of Jesus’ birth, the event, to such a degree that we omit ourselves from the story. When that happens we deny ourselves the experience of Christmas and Christmas is just another event in history. We might as well sing Happy Birthday as O Come All Ye Faithful. Let’s not do that. Let’s not limit the beauty and breadth of the Christmas story to the historical particularities of Jesus’ birth. It’s bigger than that. It’s more than that. That Jesus’ birth happened within a particular set of circumstances – a specific place, a specific time, a specific woman – doesn’t mean his birth is limited to, defined by, or contained only within those circumstances. It means, rather, that we must look for and experience his birth in the particular circumstances of our own lives. 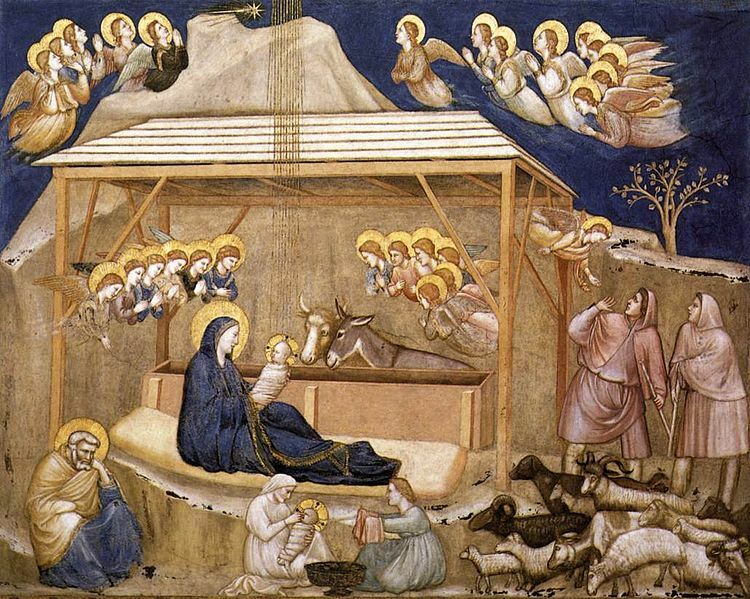 Christ is born in the particularities of life, his and ours, then and now. So where do we go to see this thing that has taken place and what does it look like? Start with the circumstances of your life. What does the manger of your life hold? Hope, fear, joy, sorrow? Maybe grief and loss lie at the center of your life. Maybe it’s thanksgiving and abundance. Maybe it’s emptiness, a lack of meaning, or darkness that lie in your manger. Are you holding guilt, resentments, regrets? Is you manger full of pain? Where does it hurt? What concerns fill your life? What lies in the cradle of your life? Whatever it is, whatever your circumstances are this night, that is the manger in which you will find the Christ child. The manger of your life and the manger of Christ are not separate. They are two ways of seeing and describing the same thing. There is only one manger. For if Christ is not born in the real life everyday circumstances of our lives he isn’t born anywhere. From that one manger we are all given new life, new hope, new possibilities. You see, that one manger holds more than circumstances and a baby. It always holds more than we can see. It held more than the shepherds could see. That night the shepherds went to Bethlehem to see this thing that had taken place and they found “the child lying in the manger” but they had no idea how much more that manger held. It held the shepherds before God and God before the shepherds. And it still does today. Christ’s manger, our manger, holds all this and more. It did for the shepherds and it does for us today. The manger has never been emptied of its power and meaning, and never will be. It’s the place where God’s life and our life meet and intersect. It’s the place where our lives are fed and sustained in the midst of and sometimes in spite of our life’s circumstances. How could it be anything less than that? After all a manger is just a feeding trough and this one stands in Bethlehem, the House of Bread. So whenever you’ve experienced your life being nourished, grown, enlarged; anytime you’ve received or offered forgiveness; when you’ve seen the world with new eyes; whenever you’ve awakened to a deeper and more profound meaning of your life; every time you’ve united yourself with the pain of the world; wherever you’ve experienced the light pushing back darkness; when the impossible became a reality; when you’ve looked in the face of another and seen the holy; whenever you’ve joined your life to another’s and held nothing back; when consolation and strength carried you through loss and sorrow; anytime you feel yourself to be loved not because of what you have done or might do but simply because you are; whenever you’ve remembered and reclaimed yourself as a beloved daughter or son of God; whenever you’ve experienced any one of those or a thousand other things like them you have gone to Bethlehem and seen this thing that has taken place. It’s Christmas and Christ has been born anew in your time, your place, your life. There is no single Christmas story. There are an endless number of Christmas stories and they are happening all the time. There are at least as many Christmas stories here tonight as there are people. Remember what the angel told the shepherds, “I am bringing you good news of great joy for all people.” Not some people, not just the good people, not the believing people only; all people. No one is left out. So tell me, when have you been to Bethlehem? What did you see? What did you experience? Now I see where you were going when you prayed that Pansy and i would find the manger in our lives this Christmas. Thank you for another challenging message. Lawrence, I hope you and Pansy are having a good Christmas and that your mangers overflow with life and joy. Thank you – this needs pondering upon. Pondering, that’s the way of Mary. She ponders and treasures. Beautifully expressed, thank you Mike! tears and a moment closest to Christ! I’m glad Charlotte, thank you. Narelle, thank you for your Christmas story. I celebrate with you and give thanks for this miracle. Births of every kind are always miraculous. Merry Christmas, much joy and many blessings in the new year. Uplifting, as always. Thank you, Father. For me, Christmas means a sense of direction and the convergence of all my stories over the year, which makes me feel light and free, almost as if flying. It’s a wonderful feeling. How beautiful, Estera; thank you. I like the way you describe our many stories converging as if they are chapters in a larger story. Thank you, again, for your poignant reminder of the many meanings of the “Christmas story.” Mine involves the hope in the Holy Presence Who makes all the difference in my life and in my understanding of the lives of those in our world. The Hope in Whom I Trust will “Never leave or forsake” us; loves us/me unconditionally; has been with me in Extreme Empathy during times I have fallen or been hurting deeply, teaching me humility and yes, that Hope. The manger never disappoints. Thanks for sharing your Christmas story.